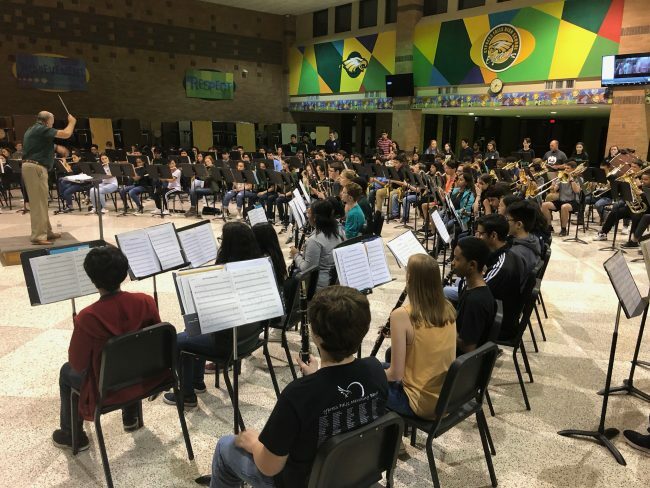 Students within the ensemble program of Cypress Falls participate in University Interscholastic League (UIL) contests, band festivals, athletic events, and concerts. Marching Band members will travel for competitions both in-state and out-of-state, and will perform in the UIL circuit as well as the Bands of America Regional Circuit (BOA). The color guard and percussion ensembles may also participate in Texas Color Guard Circuit(TCGC) events or Winter Guard International(WGI) competitions. All ensembles within the Cypress Falls Band Program perform at superior levels and receive education in individual instrumental instruction, ensemble pedagogy, as well as perform a wide variety of high quality literature within the musical world. Students can also be offered numerous opportunities to lead within a section, or as a soloist. The aspects of discipline, multitasking, time management, efficiency, learning to express oneself, and enjoyment of performing for others that occurs within the band program are instrumental in the growth of students as people, helping them to be successful outside of their secondary education. Ensembles consist of the Golden Eagle Marching Band, Concert Band, Symphonic Band, Symphony Winds, Wind Symphony, Color Guard, Novice Winter Guard, Junior-Varsity Winter Guard, Varsity Winter Guard, Front Ensemble, Battery, & Percussion Ensemble(s). The band is a proud spirit organization of the Cypress Falls High School and supports all aspects of the school. Interested students in auditioning for band may speak with the directors prior to the beginning of the year. Please feel free to explore our specific ensembles to learn more about what kinds music they perform as well past UIL ratings.